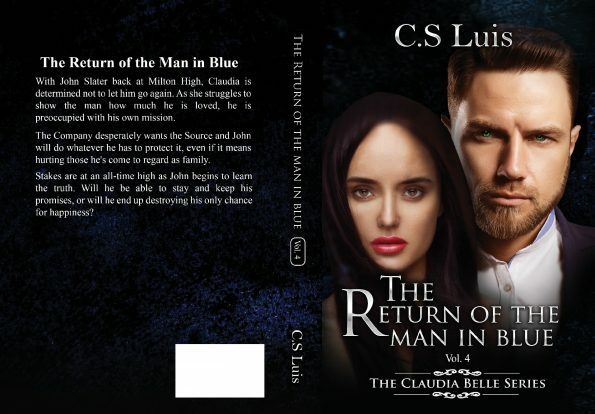 C.S Luis is the author the paranormal romance, The Man in Blue Vol. 1&2, from The Claudia Belle Series. She is currently working on the her 8th book. The first 4 books of the series are on sale on Amazon. The Man in Blue Vol. 1&2, The Extraction vol. 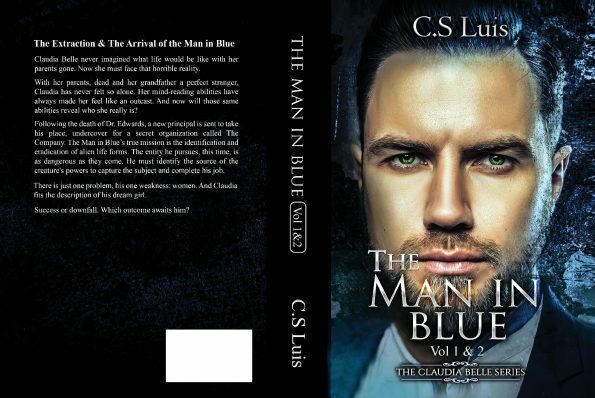 1, The Arrival of the Man in Blue vol. 2, The Connection vol. 3, and The Return of the Man in Blue vol. 4. On her share time C.S Luis enjoys oil painting, drawing as well as reading and writing. Her favorite authors include Anne Rice, Joe Hill, L.J Smith, E.L James, Christopher Moore, Chuck Palahniuk to name a few. 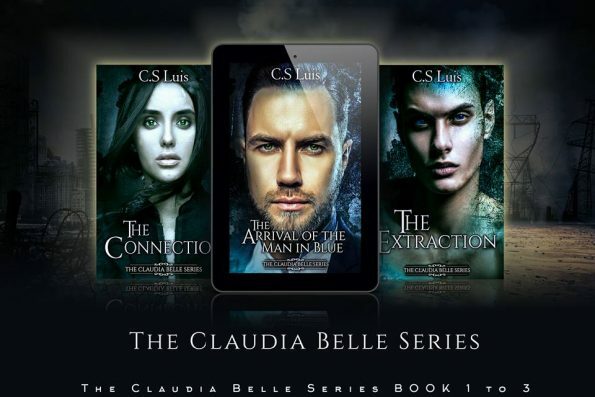 Claudia Belle never imagined what life would be like with her parents gone. Now she must face that horrible reality. With her parents, dead and her grandfather a perfect stranger, Claudia has never felt so alone. Her mind-reading abilities have always made her feel like an outcast. And now will those same abilities reveal who she really is? Following the death of Dr. Edwards, a new principal is sent to take his place, undercover for a secret organization called The Company. The Man in Blue’s true mission is the identification and eradication of alien life forms. The entity he pursues, this time, is as dangerous as they come. He must identify the source of the creature’s powers to capture the subject and complete his job. There is just one problem, his one weakness: women. And Claudia fits the description of his dream girl. Success or downfall. Which outcome awaits him? I watched as my grandfather made his way to the door. The food he had put in the pan was sizzling again. I stood up and walked over, picking up the fork and flipping the bacon in the pan. It felt almost normal, even though I was certain I would never feel normal again. Father was dead. Mother was dead. I was living with a stranger, although not an unkind one. I sighed, realizing I was being unfair to this man. He returned with a large white envelope that he sat on the edge of the breakfast table. I didn’t turn around to look at him, but I could tell he was watching me. Maybe he was looking for a little bit of Father in me. All around me. I thought. I know. I nearly spattered the bacon grease all over myself when I dropped the fork. I knew he could speak to me like Father could, I mean, he had done it only a moment ago. But it made me uneasy every time. I leaned over to pick up the fork from the floor, muttering an apology. He took a few steps towards me and I retreated back towards the table. The clinking of silverware and glass plates filled the silence between us as he brought me the little plate of bacon added to the already substantial amount he’d put in front of me. I picked at it, my body telling me I was hungry, but my brain despairing of ever eating again in a world without my parents. I stared at the white paper and all it entailed. It was blood money. I would rather have my parents. I frowned, realizing that I was acting like a baby. I wasn’t a baby, and by the way grandfather was reaching out to my mind, I could tell he was trying to figure out what I was thinking. I don’t even know if he realized he was doing it, or if he knew I would notice. I shrugged. I knew that perfectly well, and Father had told me not to do such things. It was dangerous, it would get us hurt. It had gotten him hurt. I gave myself a mental shake, I didn’t know that for sure, I was just assuming. I picked up a piece of bacon and slowly chewed. “Things?” I replied, my voice incredulous. “No.” I said, refusing to voice the word ‘crazy’. “This is crazy.” Stop. The whole thing sounded absurd. He reached out and touched my hand, willing me to listen. My eyes widened when his skin touched mine. Behind his shoulder was a hulking dark figure, its face obscured by a deep hood. A skeletal hand poked out of one dark sleeve and an impossibly large scythe filled the kitchen. The head turned and I saw its searing white eyes. I yanked my hand back. The vision was gone. Grandfather was staring at me with wide eyes. “What did you see?” he asked. He tried to reach out and touch me again. “I didn’t see anything!” I said, my voice high-pitched and squeaking. If anything, I didn’t want him to touch me and summon that horrible creature back into the otherwise normal kitchen. “I don’t know anything about things!” I shouted, standing up from the table. The vision hung in my mind. Father could sometimes sense such things as well. Grandfather looked at me from the other end of the table, his brow furrowed in concern. He looked so frail, and around the edges, I could see how he was my father’s father. “Our abilities can give us warnings. Premonitions.” He made us sound like we were fortunetellers or crystal ball gazers. It was absurd. “This isn’t a fairy tale, Claudia. You know that your ability is real.” You know you can hear my thoughts, just as I can hear yours when you let me. I turned away, not wanting him to be able to see my face. My hands started to shake. “You’re scaring me.” He reached out to me again, but I moved away further so that I could be out of reach. It was the second time he had said it, and I didn’t believe it any more than the first time. These premonitions he spoke of, if they were real I would have been warned. I would have been able to stop Father and Mother from sending me away. I wouldn’t be sitting across this table from this crazy relation I didn’t know that I had. He let me go. When I got to the top of the stairs, I glanced back at him. The shadow was there, hanging over his head. I shivered and tried to think of something else. A supernatural sinkhole has brought The Company to Milton High. The Man In Blue has yet to make progress on his mission. 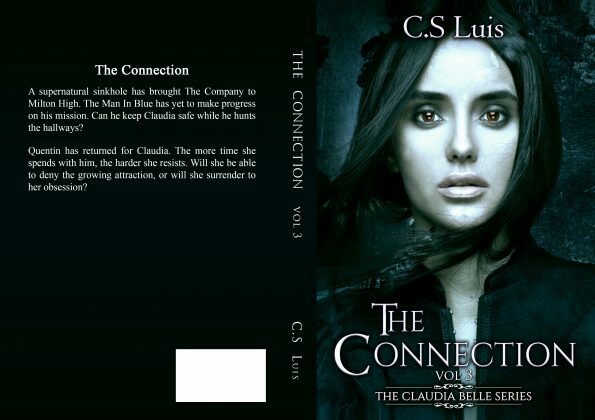 Can he keep Claudia safe while he hunts the hallways? Quentin has returned for Claudia. The more time she spends with him, the harder she resists. Will she be able to deny the growing attraction, or will she surrender to her obsession? With John Slater back at Milton High, Claudia is determined not to let him go again. As she struggles to show the man how much he is loved, he is preoccupied with his own mission. The Company desperately wants the Source and John will do whatever he has to protect it, even if it means hurting those he’s come to regard as family. Stakes are at an all-time high as John begins to learn the truth. Will he be able to stay and keep his promises, or will he end up destroying his only chance for happiness? Nightmares of Quentin have plagued Claudia since he tried to force her into Demos with him for good, but this new premonition of his death is different… and more than she can handle. With all the determination she can muster she sets off for the alien world seeking Q and all the answers she’s sure to find with him. Matters are once again complicated by the return of John Slater. He’s a man with one objective: save his girl. Will he be able to convince her that everything he’s done has been with her best interests at heart? Or will she be forever lost to him as she gives in more and more to the bond she shares with Project X?